We have an FTC Robotics team at West Catholic High School in Grand Rapids, Michigan. We sponsor both high school and middle schoolers. 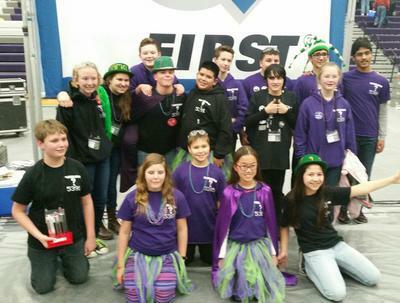 At the middle school level, we have two teams that qualified at State finals and will now move onto FTC Super Regionals in Iowa this March, 2016. For a fundraiser, we felt the slogan could apply to a life outside of robotics, as well as, an inside joke to robotic enthusiasts, because the robots are always breaking at the worst time during competition. The final touch was adding a Robot character, illustrated by a 14 year old team member. The cool part was that we could see our fundraising profits displayed instantly, based on the price and goal we set. The website also says it's okay to not reach your goal. You get to set a campaign length from 7-21 days. We decided on 3 weeks for our fundraiser. The next step was a simple page to setup a title and description for the fundraiser. You can add a logo and/or banner too. The final step was to enter our contact info and launch. You immediately see your own fundraising web page, displaying your message and t-shirt for sale. The coolest part of all, we never had to pay anything. Setting up the campaign was easy, now came the work, but admittedly it was simpler than so many other fundraisers we have done. It was time to promote our Fundraising campaign. Email to our list of parents and supporters. Every email and social post included a quick memo, encouraging others to spread the word, a product image and Web link. Do this twice the first week, 3 times the second week and every other day during the third week, with a reminder of the deadline. Most of these online fundraising companies make sharing easy. From your fundraiser web page you can share on Facebook, Twitter, Pinter estate and email. Tip: For email, send it to yourself. The email you receive will include a nice product image and message that you can modify and forward to your list. As fundraisers go, you usually have a few parents that get the message out much more than others, but that's okay. Every shirt sale counts. The daily effort was 5-10 minutes. The fun part was going to our site, where you could see how many shirts have sold. If you logged in, you could see the profits raised so far. Be patient and persistent. The first week or two may not sell as many shirts as you hoped. But keep asking. Our campaign had reached 50% by the end of week two. With only 3 days left we were at 70%. In the last 3 days our efforts paid off. We beat our goal. Our campaign ended January 31st, 2016, selling 116 t-shirts and raising $1323.00. This is a really great idea for school fundraising that would work for all sorts of groups. There are lots of companies offering this service to fundraisers. The real advantage is that it is print on demand so there is no outlay on stock which might not sell. Well done Ellen and thanks for sharing.